November 28, 2018 / TheNewswire / Vancouver, Canada - Guyana Goldstrike Inc. (the "Company" or "Guyana Goldstrike") (TSXV: GYA, OTC: GYNAF, FSE:1ZT) is pleased to report that the technical team has made a new discovery of quartzite-metachert (host rock) float at the Toucan Ridge area on its Marudi Gold Project ("Marudi" or the "Property") located in the Guiana Gold Belt, Guyana, South America. Large fragments of angular host rock float (quartzite-metachert that has broken away from bedrock) are present in a 250-metre-long section along the crest of a spur ridge that descends to the southeast from Toucan Ridge. This new discovery is approximately 350 metres east of trench TTR-18-14 where the technical team has currently commenced sampling and mapping. It is also approximately 1150 metres northeast of TTR-18-6 which is the most western trench on the ridge. Recognition of this occurrence of host rock for gold mineralization is a new discovery within Toucan Ridge. The technical team plans to immediately trench the new discovery area with the commencement of trench TTR-18-15. Please view below, "Toucan Ridge Location Map" for the Toucan Ridge area of interest, new discovery site, shown by red stars, and all trenching performed at the ridge. A total of 2202 metres of trenching has been completed and 711 samples taken at the Toucan Ridge area. The area of interest continues for more than 1.75 kilometres to the east of trench TTR-18-06. To date, a total of 9 trenches have been completed within the area of interest. Trench sites are planned where quartzite-metachert is exposed or interpreted to occur beneath the transported overburden. In May of this year, the technical team made its first discovery of gold mineralization at the Paunch area. At Paunch, trench sampling was performed on the silty saprolite metasediment. Assay results with peak gold values of 7.45 and 5.98 g/t Au were obtained and suggestive that the gold dispersion was down slope due to transportation and originated from a nearby, yet undiscovered bedrock source. This source is possibly on Toucan Ridge. Please see below, "Toucan Ridge Location Map" for the location of the Paunch area trenching. One historical hole has been drilled near Toucan Ridge. 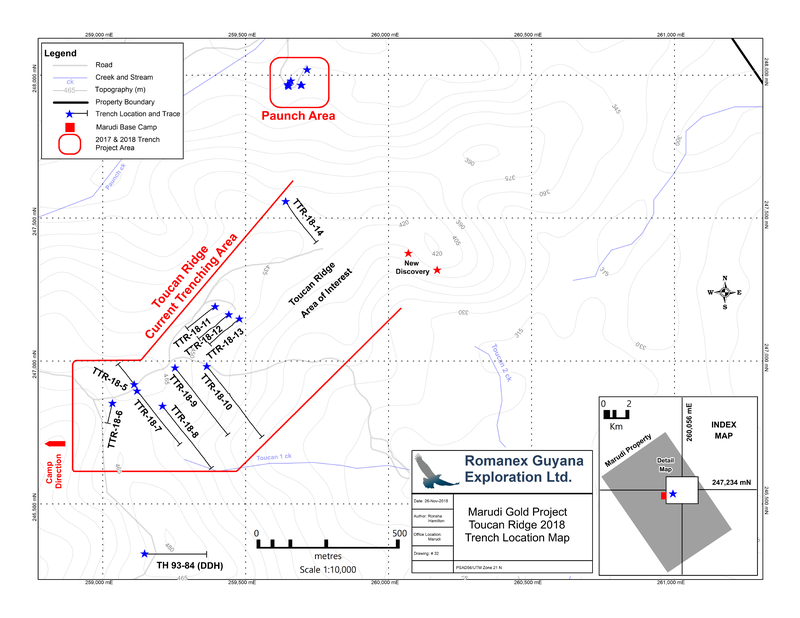 In 1993, Romanex-Sutton drilled 300 metres south of the ridge at the Toucan Hill area. The hole encountered a 39 metre section of elevated mineralization including 3 metres of 0.82 g/t Au at a depth of approximately 180 metres below surface. The hole terminated at a depth of 230 metres below surface in the quartzite-metachert host rock without drilling through it. The location of the hole is marked in the "Toucan Ridge Location Map" below.